Pumpkin puree and the warm spices provide much of the color, flavor, and texture to this loaf cake. I stirred in almost a full cup of mini chocolate chips (I did have three loaves to spread it around in, after all). I did not incorporate walnuts into my batter in this case but I think it would add another great layer of flavor and texture if you're making this for nut-lovers. My three small loaves took about 40-45 minutes to bake. Test with a cake tester and pull them out when it comes out clean. I like making smaller loaf cakes so we have the option to freeze one or two for another time, or give one or two away as gifts. The firm, cardboard loaf pans I used are great for gifting; just let the cakes cool completely in the paper pans, then slide one in a cellophane gift bag and its ready to go. Just be sure to make yourself a cup of tea, slice yourself a piece, and sit down for a little tea break. Tea time is such a treat. * This is the spice mixture I used out from what I had on hand. You can substitute with 1 1/2 teaspoons of pumpkin pie spice. Preheat oven to 350 degrees. Spray a standard loaf pan with baking spray (if using disposable mini loaf pans like I did, they often do not require greasing). Sift flour, all the spices, baking soda, baking powder, and salt together in a bowl. In the bowl of a stand mixer, beat butter on medium-speed until smooth. Gradually beat in the sugar, followed by the eggs, one at a time. Scrape the sides and bottom of the bowl, then beat in the pumpkin puree and vanilla. Beat the dry ingredients into the mixture in two batches, alternating with the milk in between. Stir in the mini chocolate chips with a rubber spatula. Transfer batter into the prepared loaf pan (or 3 mini loaf pans), smoothing over the top. Bake until a cake tester inserted in the middle comes out clean, about 55 minutes (or about 40 minutes or so for the mini loaves). Remove from the oven, let cool in the pan for about 15 minutes. Turn cake out onto a cooling rack and let cool to room temperature. The cake can be kept at room temperature, wrapped tightly, for 2-3 days. You must have known that I just cooked some pureed pumpkins. These mini loaves look awesome, Monica. Oh my - homemade pureed pumpkin would take it up a few notches! Happy first day of fall. I certainly would fancy a slice of this for breakfast tomorrow so save me a slice, I will be over in about 22 hours..give or take a few minutes.. LOL I love the pumpkin and chocolate combination and I really love how the pumpkin makes this bread so moist... You know we really are funny... see you are making a nice pumpkin bread and I was making some mooncakes in my kitchen this week... LOL Wishing you a super Mid-Autumn Festival dear!!!! It is truly funny how we adapt to our environments, eh? : ) You have a wonderful mid-autumn festival, too! I imagine it will be stunning to see the lanterns in HK. Happy first day of fall, Monica. These pumpkin loafs are the perfect way to celebrate the first day of fall! So good. Thanks, Anu. I had a hankering for some warm spices...amazing how our taste buds demand new things when the weather turns. Omg! Loving the combination of pumpkin and chocolate! Want!! Thanks, Asmita. Glad you like it. I LOVE the pumpkin and chocolate combination! This looks so good! Definitely the season for quick breads and cakes and warm spices. Thanks! 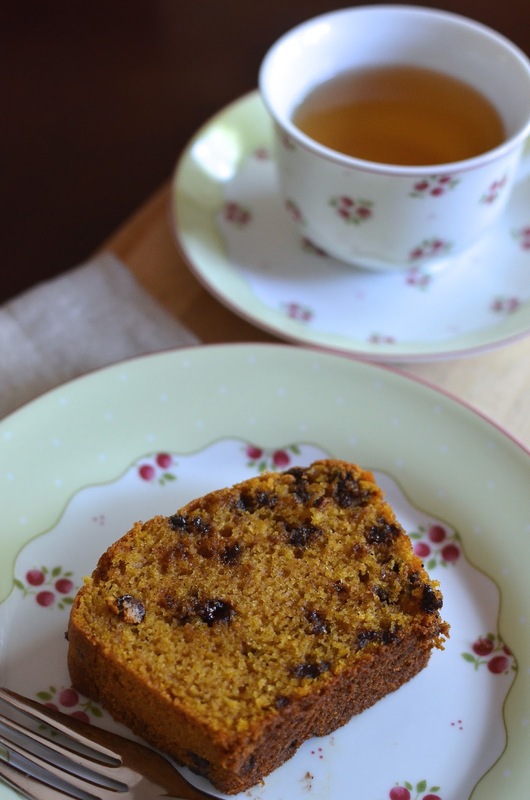 Tea time is a treat and so is this lovely loaf. I love the smaller loaves - so easy to freeze or share. I can almost smell the aroma of this cake baking. A hot cup of tea, melt in your mouth warm pumpkin cake - gosh I am ready! What a wonderful way to celebrate the first day of fall. Thank you! This loaf cake is perfect for the first day of fall! Love that you made mini ones, they look so adorable and incredibly soft! These little loaves would make great gifts (or care packages)! I think of fall as pumpkin bread season; lovely at tea time (as you suggest), very halloween-ish, and a great Thanksgiving treat! Adding the spices in separately is perfect for me. I am not a cloves fan, so can just leave them out! These are so cute! Love the idea of your own pumpkin spices (we don't have a mix here and I do what you did and just add whatever I have to hand that sounds about right). I'm finally willing to embrace all things pumpkin! It took me long enough. LOL I can't wait to try these!! 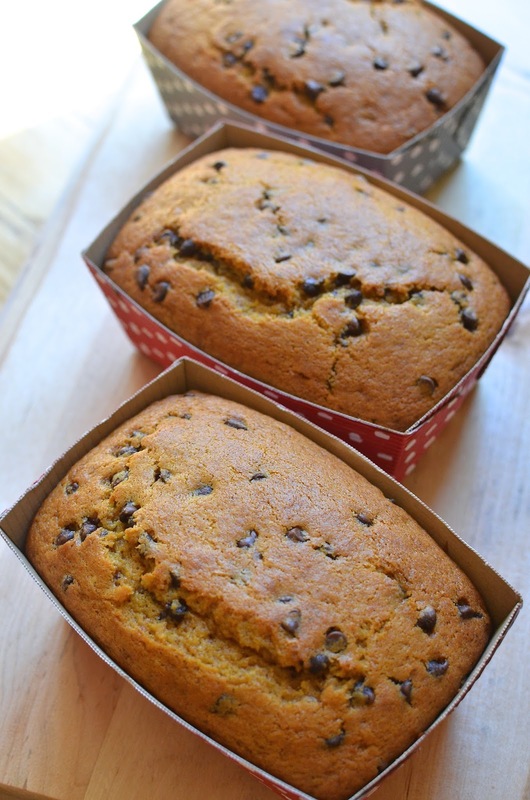 Great idea for using pumpkin and those little loaves sound delicious. It's a very easy, quick bake, with nice results. Thanks! Your little loaves are so cute - my mouth is watering just looking at them! This has to be my all time favorite favorite fall treat!! Those warm spices, right? : ) Saw your ginger cookies and seriously craving a few! Chocolate is your season - I like that! haha I just started getting the urge to bake with pumpkin! These loaves look delicious - pumpkin and chocolate is so good together! The mini loaves are a great idea - so cute too! Yes, chocolate is my all-season treat. : ) Everything does seem better in miniature. I was in a pastry shop today and all those little colorful pastries just call out to you. Happy Fall baking! Yes, no one complains about having chocolate chips in anything! Thanks, Monica. I wish I came here two days ago, because then I could have used this in my mooncake recipe! Love how round and full the loaves came out...yum!! haha - your mooncakes are unbelievable! They look amazing and the filling (plus, all the possibilities) is so creative! Thank you. Haha, chocolate is my season too! These cakes look very moist. The top is baked nicely brown. I bet they smell fantastic when they were in the oven. No doubt I have to try it this fall!